Join the reception in the Walsh Gallery at Seton Hall University in South Orange, NJ on Thursday, June 6th between 5 p.m. to 9 p.m. My installation is included in a new group exhibition and the curators are hosting a gathering. The exhibition has two curators, Gallery Director Jeanne Brasile, and Independent Guest Curator Lisbeth Murray. The show features artists working on the cusp of art and science by integrating methodologies or concepts borrowed from science. They each separately select art as the exhibition format includes two shows under one curatorial concept. This presents a unique dialog between curators and artists. Window Rafting is a miniature garden using simple hydroponic methods of growing indoors, year round, organically, and sustainably. Six inches in diameter, a clear hanging container is suspended with water, nutrients, and plants. 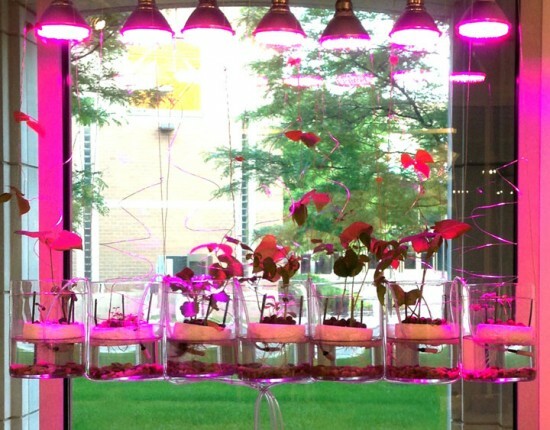 Ambient pink grow lights grace the space and brighten a blend of horticulture. Window Rafting transforms the space and aims to transform how the science of agriculture is viewed or practiced in our culture. June 3 to July 18. Bring along friends and family. There’s plenty of room in the gallery and food at the reception.